Completely conversely to the bright walls of the typical contemporary art gallery exhibition, the temporary exhibition at the Halle Saint Pierre in Paris was shrouded in darkness. 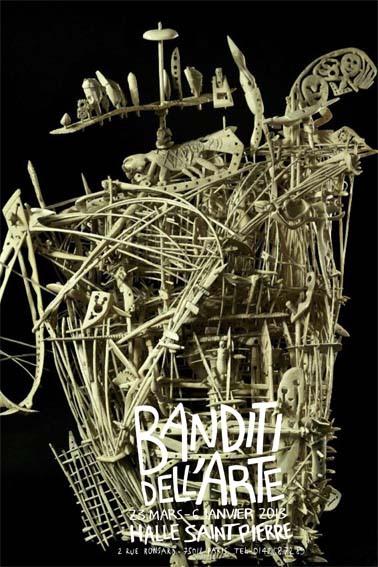 This exhibition is called ‘Banditi dell’arte’ (which Google Translate tells me means ‘Bandits of the Art’) and is the first exhibition in France of Italian Outsider Art. At the bottom of the hill that leads up to the Sacre Coeur and Montmartre; one of my favourite Parisian places, sits the Halle Saint Pierre, an institution which celebrates the work of Outsider Artists. One of my interests regarding Outsider Art is how, often, the work of marginalised artists is displayed so differently to the work of ‘non-marginalised’ contemporary artists. This is what I was thinking about during my visit to Banditi dell’arte, and therefore, what this blog post will be focusing on. On entering, the exhibition space was very, very dark. Black walls. Spot lit works. It was incredibly different to what you might expect when visiting a ‘white cube’ contemporary exhibition. Many of the works, I found, were by ‘anonymous’ artists – and many of the works in fact were also nameless – something, perhaps, one would not come across in the commercial, contemporary art world. The works were grouped by artist, with a brief biography (only in French) and each artist almost had their own ‘mini-exhibition’; four or five works on display and their own corner or section of the room. There seemed to me to be no chronological order or narrative to the overall exhibition – perhaps just the fact that they were Italian Outsider Artists. There was also no set format for the display of the works, it was almost as if someone different had curated each artist’s ‘mini-exhibition’. Also, I found there were a considerable amount of photographs representing installations (rather than actually having the installations on display within the exhibition). Upstairs, in their more permanent exhibition room, I found the obligatory white walls. Similarly to the temporary exhibition space, this area also designated a space to each artist; they had their own sections again displaying about four or five works each. In terms of the technology used within the exhibition, any notebooks or doodle-books that had once belonged to the artists were displayed on screens that provided a slideshow of the pages. I found this quite a nice touch, as the actual book was under a glass case, but you were still able to explore the work inside of it. Something I noticed, in both exhibition spaces in fact, was that because of the partitions and dividers that separated each artist’s ‘mini-exhibition’, you were never just looking at one piece in isolation. Whilst looking at one artist’s work, you could be peering through the gaps at another’s at the same time. I would like to do some more research into the differences that are perhaps apparent between the exhibiting of marginalised artists work and that of ‘non-marginalised’ contemporary works. For now, I hope you enjoy this post. Sorry it is quite brief, I just wanted to get down everything I had written on a scrap of paper during my visit before I lost it!